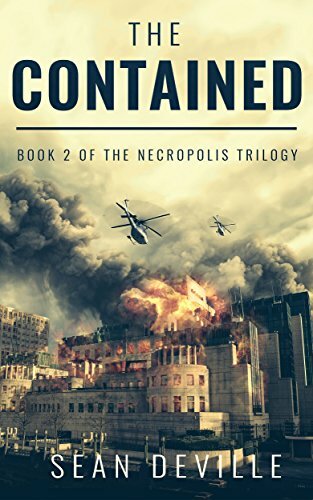 The Contained is the second in the Necropolis Trilogy by author Sean Deville. Following immediately after the events that reduced The UK to a smoldering ruin in “Cobra Z”, “Contagion” continues the stories of not only the survivors, but the affected and undead in the days following the outbreak. Contagion spends most of its time tackling the looming impact of an infected England on the rest of the world. Strict quarantine zones have been drawn and are being brutally enforced. As the not yet infected seek out a save haven, military planes fly in bomb run formation all over the countryside as the objective becomes less rescue and more survival as the infected begin to spread faster than they can be contained. With England’s future looking bleaker by the minute, the other nations of the world have gathered to discuss authorization of drastic measures to keep the virus from spreading to their shores. When the mastermind is located and finally eradicated, it appears that the threat may been eradicated, but this sets off a chain of events that may very well see the entire world burn. I am really liking the progression of this story and it is intriguing to watch battle lines clearly being drawn. While this is to be expected in any story with any semblance of conflict Deville makes even this aspect unique because not only is it between the living, the infected and the undead but the infected and the undead are also separate factions with separate agendas. Within the infected there are a few who can be described as “infected but not affected”. We see this best in the street thug Owen who even after being bitten has retained his faculties and does not appear to have succumbed to the “feed, spread” mentality of the other infected. Even while he gains an ability to control and influence the infected, he loses whatever empathy and conscience he may have had and that makes him very dangerous. He is not the only one of these “infected but not affected” as Deville introduces a few others in this book as well. On the undead side there also are a handful of persons who could be described as “aware undead” and this is best illustrated with the person formerly known as Rachel. Yes, she is for all intents and purposes a zombie, but for whatever reason the virus that created her continues to mutate and neural pathways are being reformed into a semblance of sentience. These two factions formed by the same virus and with a common goal appear to be on a inevitable collision course with each other. So, the question becomes who will take the other out first and will any humanity survive? There really is so much going on in this book Deville is setting up for one hell of showdown in the final book “Necropolis”. Between the religious fanatics, corrupt world leaders, zombies, infected and civilians just trying to survive it will be a miracle if anything is left of Deville’s world at the end of this trilogy. If you are like me and have previously “read yourself out” of ZA in general I would still recommend picking this series of books. With the Necropolis trilogy, the author has managed to take a recently overworked genre and added additional twists and elements that make this a series worth reading.